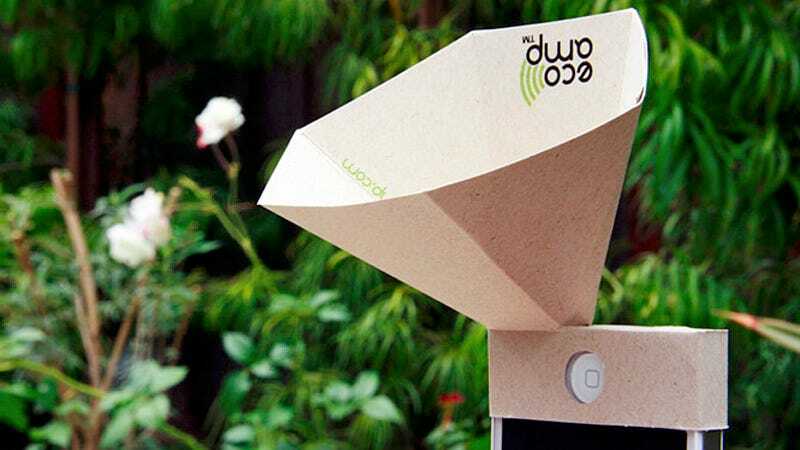 It can't compare to the sound quality you'll get from a hefty speaker dock, or even the compact Jambox, but neither of those options are as eco-friendly, or cheap, as this foldable paper cone that slips over the end of your iPhone 4. Made in Los Angeles out of "FSC Certified 100% Post Consumer paper" the eco-amp requires just rudimentary origami skills to assemble, and once it's built its clever design allows it to still fold down for easy travel. You'll want to keep it away from rain, fire, or any of paper's natural enemies, but there's a good chance you wouldn't expose your iPhone to any of them either. Since you're essentially paying $4 (2 for $8) for a die-cut piece of cardboard, we really wanted to hate the eco-amp. But if you think about it, you're really not going to find a cheaper way to slightly boost your iPhone's speaker.